Hats: Have They Had Their Day? To wear a hat or not to wear a hat? That is the question. I have something of a love-hate relationship with hats. After my horrible boarding-school hat – which I jumped on when I left school for the last time – I avoided wearing hats as much as possible. 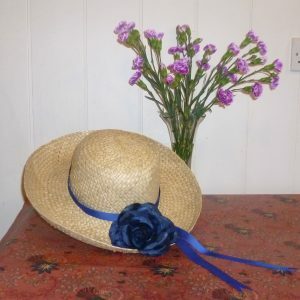 Though I see from my About Elizabeth website page that I had a white straw hat when I was about seventeen in Paris being finished – but the straw began to unravel and I was pleased to have an excuse to ditch it. It smacked too much of ‘young lady’ and I was desperate to re-invent myself. Later, when working in Fringe Theatre, I sported a rather nice white lacy wool beret. Alas, I washed it in a too hot white wash and it shrunk. At the moment, I have six hats; and one of them is the one I never wear. There’s nothing wrong with it. When I bought it, I thought it would go with everything, but, somehow it didn’t and it was uncomfortable, beside. It definitely does not bring me joy. It’s now in my ‘to go to Oxfam’ bag – I’ve decided that it can bring joy to someone else. A pity, but there we are. Fortunately, I do wear my current all-purpose hat from Monsoon. It’s black velvet and it goes with everything. Furthermore, it keeps the tips of my ears warm. I often dress it up with a brooch, usually my Celtic cross brooch from Iona as in the photo. I also have a red-felt flower brooch which works with the hat, too. Then there’s my Shetland hat. I visited the Shetlands some years ago in early April and I hadn’t really taken on board just how far north it was. I’d imagined spring sunshine; what I got was snow. Fortunately, their tourist season hadn’t yet started and shops had sales of Shetland hats and woollens. 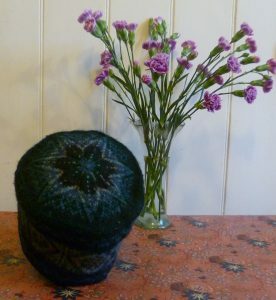 I bought this hat (and two Shetland jumpers) and it’s wonderfully cosy and comes right down over my ears. I wear this hat a lot and, when I wash it, I do so carefully! I have two sun-hats. There’s the one I bought in Rhodes many years ago. The friend I was with told me that it made me look like Virginia Woolf, which rather alarmed me. I have great respect for Virginia W., but I wasn’t at all sure I wanted to look like her on holiday. In any case, the wide brim made it susceptible to being blown off. I tried using a hat pin – which worked OK, but made me look even more Bloomsbury. 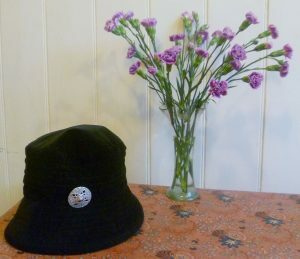 Most of the time, this hat lives in my cupboard; it hasn’t quite got to the Oxfam bag stage yet but it probably will. Perhaps I should send it to Oxfam with a label attached: You want to look like Virginia Woolf? Then this is the hat for you! 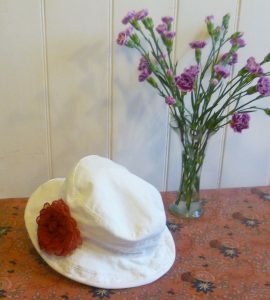 I bought a simple white cotton sun-hat to replace the Virginia Woolf hat in Cambridge Market. I really like this hat; it folds up neatly when packed and it doesn’t shrink when washed. I’ve customized it with a red rose fabric brooch. I’ve seen other people wearing the same hat and, this way, I can be sure that the hat I pick up in the trattoria/bistro/taverna after a meal is mine. However, my pièce de résistance is the wonderful hat my cousin Noël Stewart, milliner extraordinaire, made for me for my son’s wedding. This is a hat which makes a definite statement – I love the curled ostrich quills, the romantic tilt of the hat and the large, blowsy rose – and I felt a million dollars wearing it. Noël has designed hats worn by stars like Keira Knightly and Kylie Minogue; he has worked for the Queen’s milliner, Philip Sommerville. His hats are frequently photographed in magazines like Vogue. In 2015, he won the Accessory Designer of the Year Award at the UK Fashion and Textiles Awards, so I’m very proud to own one of his hats. When I started this post, I discovered that I had six hats – which I photographed using a candlestick to prop them up on the kitchen table. I now realise that I only wear three of them regularly. It seems a pity but, although I don’t think that Noël would agree with me, I don’t think we are living in a very hatty age. 8 Responses to Hats: Have They Had Their Day? You have touched on a very raw subject here – to me, hats are a form of persecution. At school we had horrible sky blue knitted berets to wear on Sundays and I don’t think my head’s ever recovered from the trauma. If only a hat could make me look even like Virginia Woolf I’d be happy, but no – every hat I’ve ever tried on instantly transforms me into an evil gnome. At one time I invested in a beret in the hope that I might train it into making me resemble a stylish member of the Resistance, but I just looked like an evil gnome wearing a pancake. 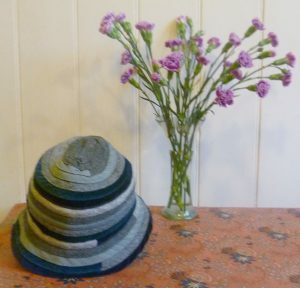 So I’m afraid to say I will not mourn the passing of the hat – even though you do look stunning in Noel Stewart’s. Thank you, Prem – I loved your comments – they made me laugh. I know what you mean, though. Every now and then I try on a hat in a shop – hoping that it will transform me into the personification of elegance. Alas, I usually end up looking washed out and about ninety. Love your wedding hat, Elizabeth, very stylish! And yes, ostrich feathers are wonderful! I only wear hats for warmth but would love an excuse to wear a really beautiful one some time. Some years ago now, I went with the RNA on an outing to a milliner in St James’s Street (were you there?) and tried on a fabulous cherry red top hat with a long veil floating from the rim – that is my dream hat and maybe one day I will own it! Yes, I remember that outing, Christina – all those amazing hats – at Lobbs, I think. And that strange Victorian contraption for measuring one’s head to get the correct hat size. It looked like an instrument of torture. I suspect that most women look for that perfect hat! I never wear hats! they always make me look ghastly when I’ve had to wear them. We had boaters in summer at school which weren’t too bad. I always fancied myself looking glam like you in the fabulous one from your cousin but alas, it doesn’t turn out that way when I put them on. I occasionally shove one of those pull-on things on my head if it’s freezing, but they squash my hair so badly I hate the aftermath. Got a hood on my coat which works better, but the cold weather is a problem when your head looks frightful without the mass of hair!! Grrrr… hats off! Thank you for your heart-felt comment, Elizabeth, which made me smile. It’s interesting how the wearing of hats – or not – can provoke such strong emotion. The wearing of a hat outdoors used to be a mark of respectability until the late 1960ss. It was the Swinging Sixties which saw it chucked to the back of the cupboard – along with so much else. Thank you also for saying I looked glam in Noel’s splendid hat. I felt good,it’s true, and it was a happy occasion. I think part of my confidence came from the ‘sock it to me!’ hat itself, which had enough self-confidence for both of us! Great post! I only began taking any notice of hats when I wrote a heroine who’s a couture milliner. My research source, Abigail Crampton, has since made me a cocktail hat with peacock swords and it’s fabulous. I love the description of your couture milliner’ cocktail hat with peacock swords, Sue! It sounds fantastic. I bet your caused a sensation! Thank you for sharing it.